If you’ve had someone swap a commercial grease filter for you in the past, you know that this can be an incredibly messy and time-consuming project. That’s especially true if you only do it once in a while. Fortunately, our professionals have exchanging your commercial grease filter down to a science! We know how to optimize each step to make it easy for your staff to get back to business quickly and with a minimum of effort. We have been trusted by major corporations and local business in California for over 40 years, and we treat each customer with the courtesy and respect that you deserve. Your grease filter is one of the most important parts of your fire-suppression strategy. Our UL 300-compliant baffle filters are the modern solution to keeping the potential of grease fires to a minimum. The microscopic droplets of grease that are continuously coming up from your kitchen systems must go somewhere, and the tiny baffles are able to trap this grease. As it builds up inside the filters, this abundance of grease becomes an increasingly hazardous situation. 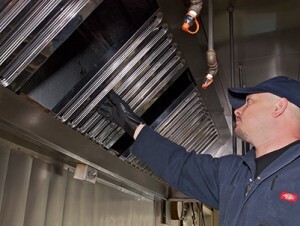 Keeping your grease filters on a steady maintenance program is the best way to reduce the possibility of a devastating grease fire that could harm employees and customers or severely damage your business. 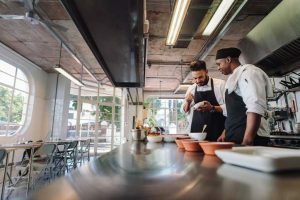 If your restaurant is doing a significant amount of business, you know that the grease can build up quickly. Fortunately, we have an easy and cost-effective solution for your business. With our grease filter exchange program, you will know that you’re always in full compliance of the National Fire Protection Association 96 codes. Ready to get started reducing your fire liability? Contact our friendly and knowledgeable associates today at 855-778-7807.